For dressing: Put garlic, anchovies and lemon juice in a blender. Blend until nearly smooth, stopping to scrape down sides as needed. Add oil, mustard, cooked egg yolks, sugar, Worcestershire and pepper. Blend until smooth. Reserve 1/4 cup of the dressing; chill, covered, until needed. Set remaining dressing aside to be used as marinade. Place each chicken breast half between two pieces of plastic wrap. Pound chicken lightly with the flat side of a meat mallet until about 1/2 inch thick. Remove plastic wrap. Place in a resealable plastic bag or covered dish. Pour the marinade over the chicken. Turn to coat. Chill, covered, for 8 to 24 hours, turning occasionally. Drain chicken, discarding marinade. Coat a large nonstick skillet with cooking spray. Heat pan over medium heat, then add chicken and cook for 4 to 6 minutes per side or until no longer pink (170 degrees ). Remove chicken; set aside. Wipe skillet clean. Recoat the skillet with cooking spray. Break eggs into skillet. Reduce heat to low; fry eggs for 3 to 4 minutes or until whites are completely set and yolks start to thicken. Flip the eggs and cook 45 seconds to 1 minute more. 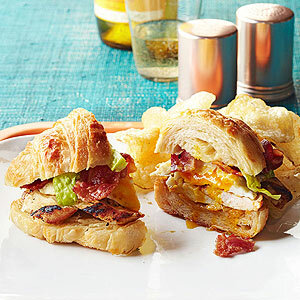 To assemble, slice chicken into bite-size strips and arrange on the bottom half of each croissant. Layer on the eggs, bacon, lettuce, reserved dressing and Parmesan. Add croissant tops.